I was speaking to an eminent broker of South Mumbai the other day who told me that there is roughly 6 crore square feet of residential space coming up between Mahim and Cuffe Parade! If this is true then we are talking of inventory worth at least Rs 1.2 lakh crores at an average price of Rs 20,000/- sq ft.!! Who is going to absorb all this supply? Realty sector seems to have found new lease on life. The year’s first major project launch in Mumbai, Lodha Group's luxury residential development saw an unprecedented response with more than 1000 applications, representing almost Rs 4000 crore of sales, from customers within the first three hours of opening the application window this morning. "This level of unprecedented success is making us consider the release of fresh inventory to take care of more demand expected over the next nine days," the company press release said. The project codenamed 'Blue Moon' is planned for development on the 18 acre land parcel that Lodha recently acquired from DLF at Rs 2,727 crore, making it the largest real estate transaction last year. Launched at Rs 23,391 per square feet plus floor rise of Rs 90, apartment sizes begin from 854 square feet (carpet) to 1448 square feet (carpet). Lodha has set the booking amount at Rs 9 lakh. The real estate major believes the response is indicative of the very strong demand reemerging in the real estate space. 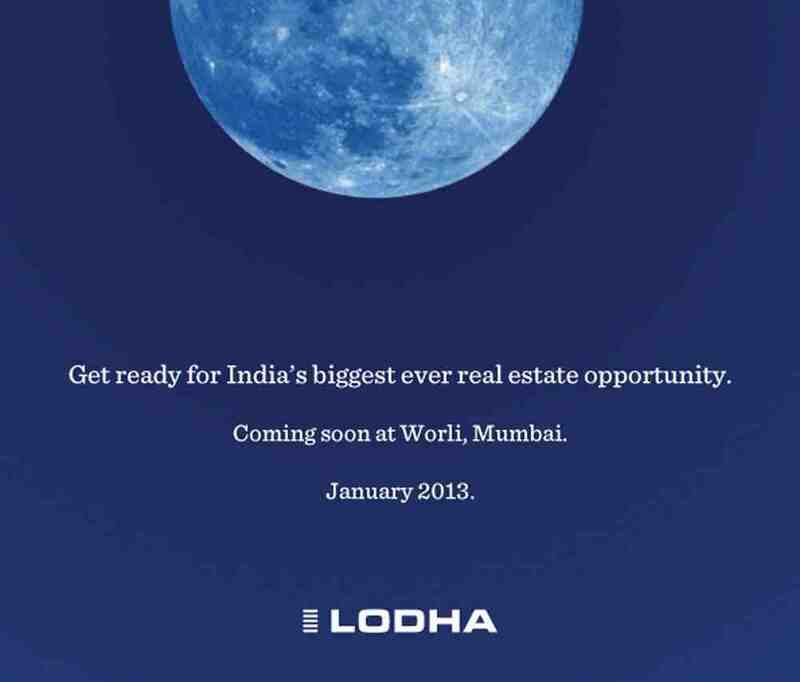 Lodhas have assured 20 percent appreciation in the second phase launch. The overwhelming response comes as a refreshing change for the sector. According to a report by real estate research firm Knight Frank, the revenues of India’s top 25 realtors had declined 4 percent cumulatively to Rs 6,744 crore in the second quarter of FY13 on a year-on-year basis, highlighting the slump in the real estate sector. However, the slide in the sales momentum of the industry witnessed until Q3FY12 has come to a halt now with realtors switching focus to the residential market, which even in this tough economic environment, fares better in comparison to commercial real estate. whether it will be in lodha's favor or not depends. may be its other way round, by removing 3L clause they would get more bogus buyers and not genuine. Isnt it buddy? And yes 3L in 21days is also not a bad gain. If you are planning to buy your dream house, don't get carried away by the numerous surveys. Knight Frank, a real estate brokerage firm, in its latest survey report said that Ulwe in Navi Mumbai, Chembur and Wadala will witness the highest appreciation in India and property rates in the city will not come down. On the other hand, Liases Foras, a non-brokerage research firm, says 32,000 flats are vacant, which may lead to a correction in property prices. Cushman and Wakefield says Mumbai needs 189,000 units in the next five years against the supply of 140,806. However, the state government's registration data shows that the sale of the property is decreasing each month, indicating a continuous glut in the market. All these reports mislead people while buying, selling and investing in property. "Instead of giving the right information, the reports confuse buyers," said Vinod Sampat, a housing expert. He added that the government should curb malpractices and wrong information which is feeding agencies by forming stringent rules and regulations. The real estate agencies' quarter-to-quarter survey report is nothing but a ploy to infuse positivity and inflate the market. "The reports cause a rise in the property rates. It is a trick used by influential developers with connivance of brokerage firms to paint a positive picture to hike the rates although there is no demand," Sampat added. Most of the real estate brokerage firms such as Cushman and Wakefield, Knight Frank, CB Richard and Ellis, Jones Lang LaSalle and international firms branches across India are involved in brokerage activities as well as conducting surveys. "It is difficult to come up with a neutral and fair survey report. Most of these agencies are committed to their clients (developers). And, they cannot go against their interest. If they start giving ground reality, then the highly inflated market bubble would burst," said Ramesh Prabhu, chairman of Maharashtra Housing Welfare Association. Prabhu said these agencies' aim is to escalate property rates and reap benefits by fooling the gullible buyers. "Real estate is the only market where the demand-and-supply rule does not apply. There is less property sale as per government record but realty prices are still soaring. In case there is no demand, price crashes. But it doesn't happen in case of property rates," he said, adding that all surveys are hypothetical and done on assumptions only. Gulam Zia, executive director of retail, advisory and hospitality, Knight Frank, refuted all allegations, saying developers are not part of their survey even though brokerage is their core business. "Our survey reports are authentic and not influenced by any developer or big land holders. We do not involve the developer in survey exercise. So, there is no question of conflict of interest. Survey of each agency is different because of different models and methodology used," Zia said, adding that they have a separate research team to conduct the survey and prepare the report. "These reports are based on government agencies' data, upcoming projects under Jawaharlal Nehru National Urban Renewal Mission (JnNURM), generation of jobs, industry, locality and transport facility. After the report is prepared, it is sent to various experts, including urban development experts. Only then is the report published and circulated," Zia said. Pankaj Kapoor, managing director of Liases Foras, said they are not into brokerage activities. "We prepare reports for banks and financial institutions only. It is important to maintain honesty and reputation in the murky real estate market. As a reason, we have deliberately kept brokerage activity out. We are not committed to any developer. So our survey report is unbiased," he said. Sources said some influenced developers and land holders, with their wish list, approach brokerage firms and agencies which prepare real estate report. "The agencies put their machinery to work and come up with one report saying property in Boisar is in demand and another saying Ulwe will have high appreciation. There is no uniformity in their findings. Not even 50% data is similar. One survey report contradicts with the other. So, reports are made to fulfill a developer's demand to rejuvenate the dying market by giving wrong calculations," said Ramesh Prabhu. A researcher in a reputed brokerage firm said that it is a dirty business but they have no other option but come up with false projections. "We do not want to lose our bread and butter by giving the real figures. Therefore, the reports are fudged to suit the developer," he said. Once the property rate goes up, developers sell the stagnant inventory. "It is win-win situation for the developers and agencies at the cost of buyers. Buyers are influenced to put all eggs in one basket. Whenever the market is down and property is not selling in some areas, the agencies come up with a misguided survey report," said a real estate observer, requesting anonymity. Atul Nemade, a real estate expert, said that most media houses have got a stake in the real estate firms. "Therefore, they do not want to give the real picture of the property market. They are always busy depicting the wrong picture by publishing high profile and isolated record transaction. And, the developers put the isolated 'deal' as a benchmark and start selling flats even though the product is inferior. It sets a wrong precedent," he said. Nemade added that the deals suit developers, agency and media houses' vested interests. "The survey reports do influence buyers in their decisions," he said. Prabhu said people should be cautious while buying property. "After reading reports, people rush to put money in the advised location. It inflates the property market even though there is no demand. It is a smart strategy by agencies and developers to misguide buyers," he said. He advised people to read newspapers and not to rely on one study report. "They should study the ground reality and do their own assessment before buying property," Prabhu added. There is a need for the real estate regulatory body like Telecom Regulatory Authority of India and Securities (telecom) and Exchange Board of India(banking/share market) to curb malpractices and control the unorganised sector. "Genuine buyers will not be cheated and influenced to put his hard-earned money at the wrong place," said Sampat. Sandeep Reddy, co-founder of .com, a brokerage firm, said there is not a single government agency that provides them data. "We have to rely heavily on random developers for information. Government bodies such as Brihanmumbai Municipal Corporation, Maharashtra Housing and Area Development Authority (Mhada) do not publish and put their approval data in the public domain," he said. Reddy added that it was difficult to visit every construction site within and outside the city. "It requires huge machinery and manpower which can be done only by the government. Therefore, lack of proper data causes variation in findings of each agency report. Once the government starts providing authentic data like in western and European countries, there will be uniformity and fairness in survey reports." Prabhu said the state government recently passed the housing regulatory bill but it requires more teeth to control and address the anomalies in the market. "Stringent laws can stop manipulation of market and cheating buyers," he said. The bill is in its final stage waiting to be signed by the President and buyers can only hope that it makes a difference in the real estate market. Please don't go blindly by what is reported by the media.There are a lot of vested interests at play. Knight Frank,C&W are the biggest partners of Lodha Group.These kind of news reports create a lot of hype and are meant to push a lot of people who are sitting on the fence over it and at times straight into a deep pit! SO BEWARE!!! It seems that with 20% lesser rates than current rates ,there is still demand for real estate.It will be interesting if this is because limited stock or for higher volumes also,demand can be sustained. If you look at the last few months reports in the media, Pankaj Kapoor and his company Liases Foras is the only firm among the real estate consultants who is talking about slow-down, correction, tough times for real estate industry etc. Rest all just keep giving ambivalent statements or tom-tomming the huge appreciation expected in varius areas. One should listen only to firms with no conflict of interest for advice. I also loved the bizarre heading mumbai mirror has given- property lottery....lovely. We buy 5 cr house as lottery... Indians have really come of age..
Lodha pays huge monies to the print media for its regular full page advertisements of various royal , dynasty and kings ransom projects. As part of these deals it gets editorial preference to put Lodha in good light. Leading print media companies have put every thing on sale from first page news to editorial to even there is a price for suppressing negative news. Needless to say Lodha has media savvy advisors and manage the media to create right noise . All suckers who think Lodha's lower parel project christened as Worli project think as a steal despite many add ons such as infrastructure fees, floor rise etc which alone will cover cost of his construction and first 20% payment covers cost of land and the rest are all his profits paid several years before the product is delivered . Developers in Mumbai and elsewhere are rejoicing! Lodha has shown them one more way of being truly innovative and introducing path breaking initiatives like charging " Infrastructure Fees"! May be time has come for someone to introduce a cost plus model where all the various costs are well defined under various heads like cost of acquiring land,cost of construction ,expense incurred for sales and marketing ,etc. The builder then adds his profit margin say 20-30% and then arrives at the final figure that is presented to the prospective buyer. Since we are talking about innovation can some builder come out with this kind of transparent and win-win model?